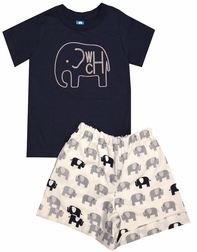 Here we have our cute monogrammed elephant frame shirt and shorts outfit. We start with a soft, navy cotton shirt and embroider it with a darling gray elephant monogram frame in with your little one's initials inside in our stacked monogram font. The navy shirt is paired with our elephant print shorts in navy and gray with cuffs OR our gray stripe seersucker shorts. ANDDD, it is also available in a John John or longall. Those are made using navy gingham and have gray buttons on the shoulders to match the gray of the elephant and monogram.